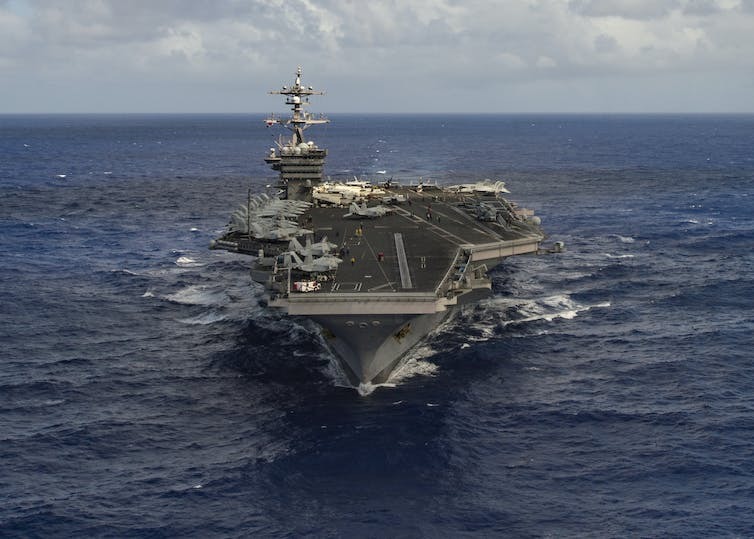 As the USS Carl Vinson and its carrier battle group steam through the Pacific toward the Korean Peninsula, many are wondering if the Trump administration could be so rash as to attack North Korea. military options for denuclearising North Korea carry unacceptably high risks of a disastrous cascade to full-scale war. The Trump administration appears to agree with the first two assertions. However, it has reached a contrary view on the threat or use of military force to tame North Korea. The end of strategic patience? North Korea conducted its fifth nuclear test in September 2016, and has since embarked on several missile tests. The reasons for these tests include advancing the technological development of its nuclear weapons program, signalling displeasure about the annual US-South Korea joint military exercises, and testing the new Trump administration’s mettle. In the past, US leaders have deployed stealth fighters and bombers to the Korean Peninsula as a signal to North Korea of the consequences of continued provocation. Trump, however, has deployed an aircraft carrier group in a move that goes beyond signalling a declaration of intent to attack. In the context of US air strikes against the Assad regime in Syria, the North Korean government would have little choice but to take the threat seriously. The risk of escalation to full-scale war has intensified. “Surgical air strikes” – similar to those conducted last week in Syria – are likely to be the US’s preferred military option. Such a proposal is not new. In July 2006, former defence officials Ashton Carter and William Perry suggested that the US could prevent further missile tests and send a strong message to the North Korean leadership by surgically attacking the country’s missile launch platforms. Such proposals have never been followed through: the assumption North Korea would not retaliate is a high-risk bet. Targeting missile facilities is one thing. Bombing North Korea’s nuclear infrastructure is a different proposition. For surgical air strikes to be successful, the US needs to be sure the most critical sites have been destroyed. During the early phase of its development, North Korea’s nuclear program was centred on the reactors and reprocessing facilities at Yongbyon. Since then, several clandestine processes within North Korea’s nuclear fuel cycle have been uncovered, or been intentionally declared by the Kim regime. The nuclear program’s crown jewels – the bombs themselves, and the stockpiles of fissile material – are likely to be buried deep in secret, reinforced underground facilities, protected from aerial attack. If there were good options for surgical air strikes, these would have been more viable during the nuclear program’s earlier phase. Should air strikes successfully target nuclear facilities, there is a risk of toxic radioactive fallout contaminating surrounding regions both inside North Korea and in neighbouring countries. The fallout risk has long been recognised as one of the reasons discounting air strikes against North Korea as a viable military option. It is possible that surgical air strikes may instead target sites associated with the North Korean leadership, in an attempt to mortally wound the Kim regime and facilitate denuclearisation through regime change. There is precedent for this: the initial attack on Iraq in 2003. US-led coalition forces targeted presidential palaces, government buildings and other “targets of opportunity” in an attempt to eliminate Saddam Hussein and expedite the conclusion of the invasion. Let’s assume for the sake of argument that an air strike successfully killed Kim Jong-un. Does the Trump administration have a contingency plan for securing a post-Kim North Korea? There is a clear risk of mission creep should the US be drawn into an extended pacification and nation-building campaign. Its experience in Iraq should offer a cautionary tale about the risks of regime change by force in the absence of a plan to win the peace. The USS Carl Vinson and its aircraft carrier group have been deployed to the Korean Peninsula. Let’s say, however, that Kim survives a targeted attack. The North Korean leadership’s strategic culture and the political capital invested in decades of anti-US domestic propaganda has created a path dependency that virtually locks in an escalation to full-scale war, should North Korea be attacked. This is one of the reasons why South Korea has not retaliated against any North Korean provocations over the past two decades – even attacks as brazen as the shelling of Yeonpyeong-do and the sinking of South Korean naval corvette Cheonan. The South Korean capital, Seoul, is acutely vulnerable to North Korean attack because of its proximity to the demilitarised zone. It is virtually indefensible against artillery and missile barrage. Is the Trump administration willing to risk a cascade into full-scale war that would jeopardise the lives of millions of South Koreans in Seoul and its surrounds? It would be difficult to see the US-South Korea alliance surviving such a disaster – especially if such a crisis was precipitated by a clumsy American intervention. Such an escalation would be a disaster for the region. Picture the humanitarian tragedy and toxic politics of the Syrian refugee crisis superimposed on Northeast Asia. Does the Trump administration have a plan for managing the regional humanitarian fallout of an escalated war? This is the nightmare scenario for the Chinese government. It is one of the primary reasons for its continued – though increasingly lukewarm – backing of the Kim regime. It is also why China will inevitably veto any resolution put to the UN Security Council for military action against North Korea. The idea that a discrete, surgical air strike could be deployed in the Korean context is a mirage. North Korea is not Syria. There is a good reason successive US presidents have settled on deterring North Korea as their default strategy. The menu of possible military options all carry unacceptably high risks. 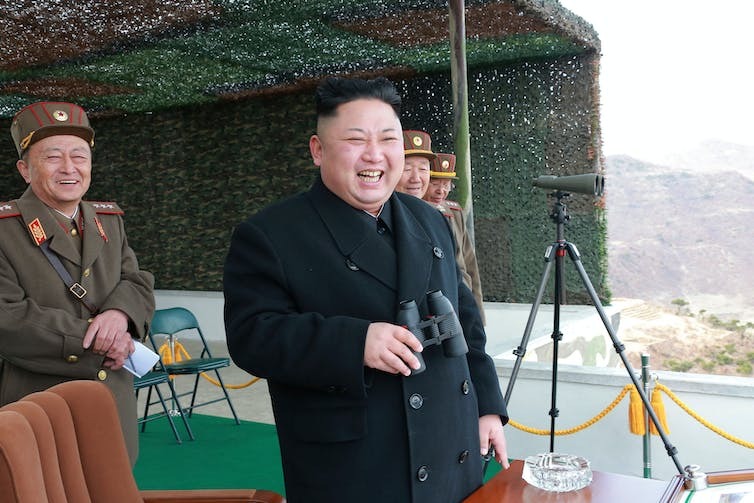 North Korea has the means to retaliate against targets in South Korea and Japan with conventional weapons, as well as weapons of mass destruction. North Korea’s capacity to attack South Korea has helped preserve a balance of deterrence on the Korean Peninsula since the Korean War armistice in 1953. While the balance of terror overwhelming favours the US, the balance of deterrence in Korea sits at a rough equilibrium. As the more powerful player, the US does not have to act aggressively to maintain this equilibrium and preserve regional stability. In this context, the threat posed by a nuclear North Korea has been exaggerated through intellectually lazy analysis based on assumptions of the Kim regime’s irrationality. More careful analysis of North Korea’s actual behaviour suggests otherwise. The overriding priority underpinning North Korean foreign policy remains regime survival and the perpetuation of the Kim family dynasty. To this end, North Korea sees hard military power as the only reliable means of guaranteeing its security in what it perceives as a hostile strategic environment. North Korea’s nuclear weapons and ballistic missile capabilities are the ultimate practical expressions of this worldview. But, more importantly, they are the North Korean leadership’s only real levers of power internationally. Trump’s foreign policy team would do well to think through the logic of their escalation. A North Korean first-strike nuclear attack against the US or its regional allies makes little sense for North Korea. From this perspective, it is a strategic restraint on America’s part based on deterrence – rather than unnecessary unilateral muscle-flexing – that’s more likely to preserve regional stability. Back in 2002, North Korea expert Victor Cha pointed out North Korea was most likely to use nuclear weapons if backed into a corner where the perpetuation of the Kim regime was directly threatened. It is a disturbing irony that by deploying the USS Carl Vinson battle group, Trump has increased the possibility of that scenario coming to pass.